What do you like about me?" to ask for compliments — for validation. 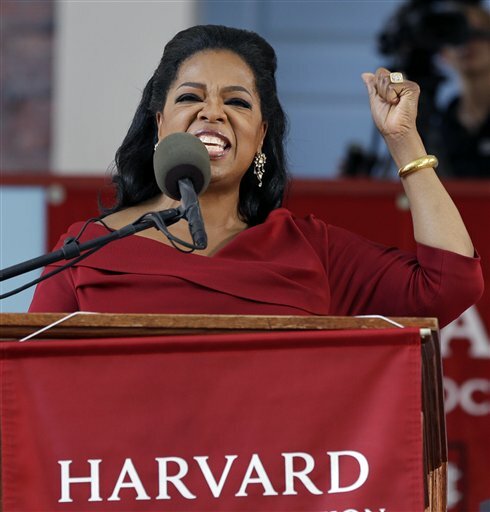 And then, on the news this morning, I heard Oprah Winfrey's speech to Harvard grads. "The common denominator that I've found in every single interview is that we want to be validated. We want to be understood. I've done over 35,000 interviews in my career. And, as soon as that camera shuts off, everyone always turns to me and, inevitably, in their own way, asks this question: 'Was that okay?' I heard it from President Bush. I heard it from President Obama. I've heard it from heroes and from housewives," she said. "I even heard it from Beyonce in all of her Beyonce-ness. She finishes performing, hands me the microphone and says, 'Was that okay?'" We're always seeking approval — whether from someone you care about…or from strangers. Research in the journal Current Biology shows the area of the brain associated with reward is more active when others agree with and reinforce, our own opinions. While I felt like I was just being insecure, the truth is, everyone wants to feel noticed. Everyone wants to feel accepted and like they "did okay" — with the clothes we wear, the way we act, in our job, in daily life, etc. Why else is there so much activity on Facebook, Twitter, Instagram, etc. — statuses updating the social network about our thoughts and countless selfies? We hope for comments and compliments. We hope to feel validated. A writer on Ragsnair said, "We don’t trust ourselves to make our own judgments. It’s not good enough for us that we are self-satisfied; we need others to corroborate what we believe." I have personally sought after validation all my life — wanting to please others way more than I've ever wanted to please myself. I am working on, more and more, to be more self validated and to stop caring so much about what others think of me. "Approval whores like me, on the other hand, tend to think that we're being good (saintly! angelic!) when we let others have their way with us in exchange for a hit of praise. The people in our lives are likely to reinforce our sickness, because we'll do pretty much anything to please them, and what's not to love about that? Here's what: Being dependent on approval—so dependent that we barter away all our time, energy, and personal preferences to get it—ruins lives. It divorces us from our true selves, precludes real intimacy, and turns us into seething cesspools of suppressed rage (of course, I mean that in a nice way)." Oprah suggests that we need to learn to tolerate the anxiety of allowing people to disapprove of you. We need to think, if we didn't care what anyone else thought of us, what would we do? And then do it! I think this is something we should strive for — to be happy with ourselves. But don't get frustrated if this doesn't happen overnight. And don't get frustrated if, as part of the human race, it never goes away completely. And, whenever you feel down on yourself and all you want is to ask for someone's approval, remember, you're not the only one who feels this way. After all, even the president asks for approval.